A triple arthrodesis consists of the surgical fusion of the talocalcaneal (TC), talonavicular (TN), and calcaneocuboid (CC) joints in the foot. The primary goals of a triple arthrodesis are to relieve pain from arthritic, deformed, or unstable joints. Other important goals are the correction of deformity and the creation of a stable, balanced plantigrade foot for ambulation. Edwin W Ryerson first described triple arthrodesis in 1923 as a fusion of the TC, TN, and CC joints. The aim was to create a well-aligned, plantigrade, and stable foot that would allow patients with paralytic or deforming conditions to function better. The most common indications were to correct lower extremity deformities in children resulting from poliomyelitis, cerebral palsy, Charcot-Marie-Tooth disease, clubfoot, or tuberculosis. The original procedures were performed by removing large blocks of subchondral bone and correcting the angular deformities by inserting or removing wedges. The corrections were maintained by casting that often required later manipulation for loss of position. Kirschner wires (K-wires), Steinmann pins, and staples were used over time to hold the corrections in place but are now not as common. Internal fixation with various compression screws using the Arbeitsgemeinschaft für Osteosynthesefragen (AO) technique and specially designed plating systems has become the standard of care. For patient education resources, see the Foot, Ankle, Knee, and Hip Center and Arthritis Center, as well as Rheumatoid Arthritis. Contraindications for triple arthrodesis include conditions that can be adequately corrected and maintained via external bracing, soft-tissue procedures, tendon balancing, or lesser fusions. Chronic smoking is a relative contraindication because of the associated high incidence of nonunion. The bony anatomy consists of the talus, calcaneus, cuboid, and navicular. The talus and calcaneus make up the TC joint (also referred to as the subtalar joint). Its articular portion is composed of the more important posterior facets of the talus and calcaneus and the smaller anterior and middle facets. The anterior talofibular, posterior talofibular, calcaneofibular, deltoid, and interosseous TC ligaments stabilize it. Subtalar motion is triplanar and is described appropriately as pronation (dorsiflexion, eversion, and external rotation) and supination (plantarflexion, inversion, and internal rotation). Clinically, however, most motion takes place in the frontal plane and is seen as heel eversion and inversion. Although normal range-of-motion (ROM) values are difficult to measure, a practical rule of thumb is 30° of total motion with approximately 10° of inversion and 20° of eversion. The sinus tarsi is a tunnellike structure extending from distal lateral to posterior medial in the rearfoot. It is formed dorsally by the concavity in the neck of the talus and plantarly by the sulcus between the posterior facet and sustentaculum tali of the calcaneus. This structure is widest laterally and contains the bifurcate, cervical, and interosseous ligaments. It is filled by a fatty plug known as the Hoke tonsil and serves as the origin of the extensor digitorum brevis (EDB). The head of the talus and the navicular constitute the TN joint. This is a condylar joint. 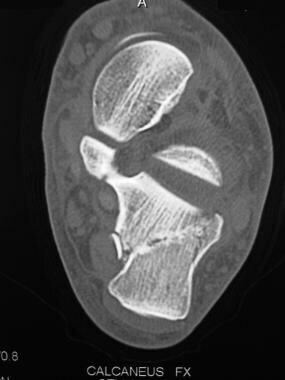 The head of the talus is convex, and the corresponding surface of the navicular is concave. This is an important spatial relation to understand because the navicular forms a lip around a portion of the talar head, making it difficult to fully access the joint and remove adequate amounts of cartilage. Normally, during stance phase, the calcaneus everts, and the talus plantarflexes and internally rotates. This action produces a relative dorsiflexion, eversion, and abduction of the navicular, which subsequently translates that motion to the forefoot. In excessive or pathologic cases, this presents as medial arch collapse with forefoot abduction. The opposite takes place with weightbearing TC joint supination. The anterior articular portion of the calcaneus and cuboid make up the CC joint. This is often the first joint resected during a triple arthrodesis and is the most easily accessible of the three joints. Directly superior to the joint is the EDB muscle belly, and lateral to it are the peroneal tendons. The sural nerve courses along the lateral side of the foot, and the superficial peroneal nerve takes a more dorsal lateral position. It should be noted that there is significant anatomic variation of the sural nerve, and care must be exercised in making the incision. The lateral incision is placed between these two nerves. The saphenous nerve and vein enter the foot on the dorsal medial aspect. A medial incision is also made and is usually located in line with and just plantar to these structures. For more information about the relevant anatomy, see Foot Bone Anatomy and Ankle Joint Anatomy. Presentations in the clinic can vary, depending on the underlying pathology. A common feature of patients is the development of DJD. Conditions that produce an improperly functioning, unstable foot that leads to DJD are the main indications for surgical treatment. TC joint arthritis usually manifests as pain located anterior to the distal tip of the fibula in the region of the sinus tarsi. The pain is exacerbated with forced inversion and eversion of the heel. In advanced cases, crepitation is noted with forced ROM. Similar findings can be seen in the CC and TN joints. Pain is usually elicited with periarticular palpation. Depending on the underlying pathology, the patient may present with a varus or valgus deformity. Posttraumatic arthritis often presents with a rectus foot and complaints consistent with DJD of the TC joint. It commonly occurs after calcaneal fractures with posterior facet involvement. Depending on the severity of the fracture, the heel can be shortened, can be widened, and can have an uneven lateral wall with bony prominences (see the images below). These findings are typically seen in lateral wall blowout fractures that do not undergo open reduction with internal fixation (ORIF). Similar fractures with inadequate ORIF, or inadequate reduction, leaving a varus or valgus deformity, can also be seen in these cases. 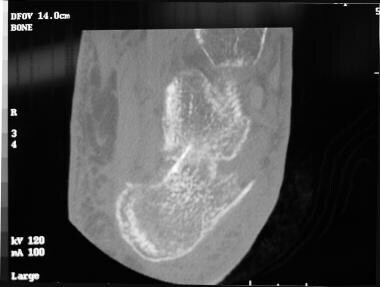 CT scan of calcaneal fracture shows prominent lateral wall with heel rotated into varus. Lateral wall blowout fracture with comminution. Note shortening and widening of heel. If left untreated, heel would remain in varus with uneven lateral wall and bony prominence that could become irritated. Relatively mild calcaneal fracture still exhibiting shortening and widening. Valgus deformities are commonly seen in collapsing pes planovalgus, late-stage tibialis posterior tendon dysfunction, tarsal coalition, and some neuromuscular conditions. They are easy to identify, especially in the latter stages of the deformity, and present with a heel in valgus, an abducted forefoot, and a medial arch that is typically collapsed (see the images below). Medial arch collapse associated with valgus deformity. Valgus foot deformity with medial dislocation of talar head. Note abducted forefoot and head of talus rotated medially on navicular. Clinical view of valgus foot deformity with abducted forefoot and collapsed medial arch. Valgus deformity with medial talar rotation that is so severe that patient bears weight on head of talus. 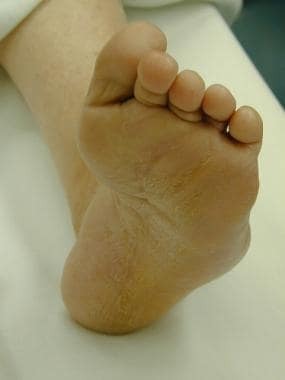 Varus foot deformities are seen in cavus foot types, cavovarus foot types, talipes equinovarus, and some neuromuscular conditions. 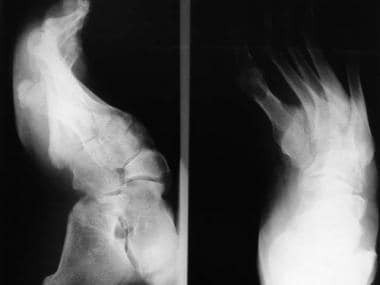 The most common neuromuscular condition presenting with a varus deformity is Charcot-Marie-Tooth disease (see the images below). This deformity is also fairly easy to identify. The patient will have a heel that is in a varus position, an adducted forefoot, a higher-than-normal arch, and ankles that are storklike. 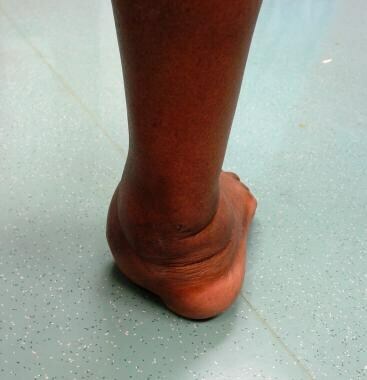 Varus foot deformity in patient with Charcot-Marie-Tooth disease. 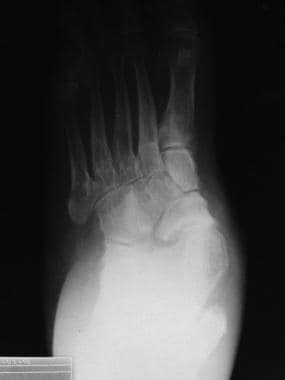 Cavovarus deformity with high-arched foot. Note hammertoe deformity to all 5 digits common to this condition. Triple arthrodesis. Cavovarus with high-arched foot, hammertoe deformity, adducted forefoot, and severely plantarflexed first metatarsal. 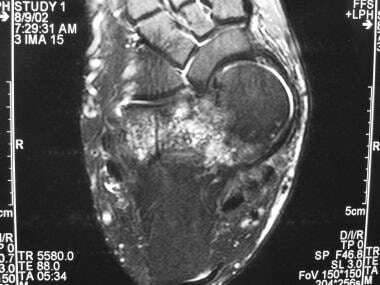 Cavovarus with high-arched foot, hammertoe deformity, adducted forefoot, and severely plantarflexed first metatarsal. Outcomes are typically good, with high union rates of the TC and CC joints. The TN joint has the highest incidence of nonunion; however, the nonunion rate decreases with better understanding of the procedure and stable fixation. Degenerative changes at the unfused distal and proximal joints are still a long-term complication, but this is true with any fusion procedure. A study examining 400 triple arthrodesis procedures found less-than-perfect results in 24.5% of patients. Up to 10 months are required for the patient to become pain-free. Return to high-impact activity is not a given. Lower-impact activities like walking, cycling, and swimming should be obtainable goals postoperatively. Ryerson EW. Arthrodesing operations on the feet. J Bone Joint Surg. 1923. 5:453-71. Knupp M, Stufkens SA, Hintermann B. Triple arthrodesis. Foot Ankle Clin. 2011 Mar. 16(1):61-7. [Medline]. Zhang H, Li J, Qiao Y, Yu J, Cheng Y, Liu Y, et al. Open triple fusion versus TNC arthrodesis in the treatment of Mueller-Weiss disease. J Orthop Surg Res. 2017 Jan 19. 12 (1):13. [Medline]. Ahmad J, Pedowitz D. Management of the rigid arthritic flatfoot in adults: triple arthrodesis. Foot Ankle Clin. 2012 Jun. 17(2):309-22. [Medline]. Munoz MA, Augoyard R, Canovas F. Surgical treatment of hindfoot inflammatory diseases: 107 arthrodesis. Orthop Traumatol Surg Res. 2012 Oct. 98(6 Suppl):S85-90. [Medline]. Suckel A, Muller O, Herberts T, Langenstein P, Reize P, Wulker N. Talonavicular arthrodesis or triple arthrodesis: peak pressure in the adjacent joints measured in 8 cadaver specimens. Acta Orthop. 2007 Oct. 78(5):592-7. [Medline]. Jackson WF, Tryfonidis M, Cooke PH, Sharp RJ. 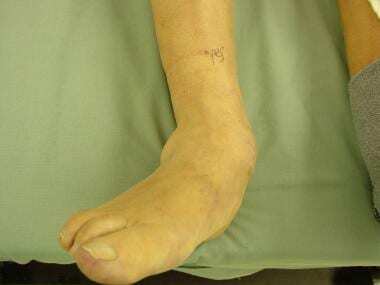 Arthrodesis of the hindfoot for valgus deformity. An entirely medial approach. J Bone Joint Surg Br. 2007 Jul. 89(7):925-7. [Medline]. Maskill MP, Loveland JD, Mendicino RW, Saltrick K, Catanzariti AR. 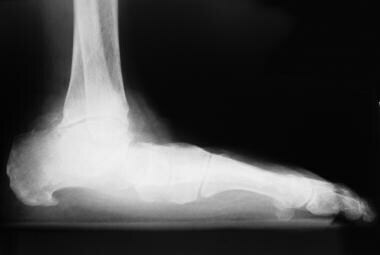 Triple arthrodesis for the adult-acquired flatfoot deformity. Clin Podiatr Med Surg. 2007 Oct. 24(4):765-78, x. [Medline]. Bono JV, Jacobs RL. Triple arthrodesis through a single lateral approach: a cadaveric experiment. Foot Ankle. 1992 Sep. 13(7):408-12. [Medline]. Duncan JW, Lovell WW. Hoke triple arthrodesis. J Bone Joint Surg Am. 1978 Sep. 60(6):795-8. [Medline]. Gellman H, Lenihan M, Halikis N, et al. Selective tarsal arthrodesis: an in vitro analysis of the effect on foot motion. Foot Ankle. 1987 Dec. 8(3):127-33. [Medline]. Talarico LM, Vito GR. Triple arthrodesis using external ring fixation and arched-wire compression: an evaluation of 87 patients. J Am Podiatr Med Assoc. 2004 Jan-Feb. 94(1):12-21. [Medline]. DeVries JG, Scharer B. Hindfoot Deformity Corrected With Double Versus Triple Arthrodesis: Radiographic Comparison. J Foot Ankle Surg. 2015 May-Jun. 54 (3):424-7. [Medline]. Schuh R, Salzberger F, Wanivenhaus AH, Funovics PT, Windhager R, Trnka HJ. Kinematic changes in patients with double arthrodesis of the hindfoot for realignment of planovalgus deformity. J Orthop Res. 2013 Apr. 31(4):517-24. [Medline]. Hatic SO 2nd, Philbin TM. 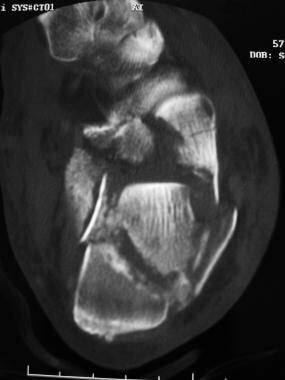 Management of the recurrent deformity in a flexible foot following failure of tendon transfer: is arthrodesis necessary?. Foot Ankle Clin. 2012 Jun. 17(2):299-307. [Medline]. Anand P, Nunley JA, DeOrio JK. Single-incision medial approach for double arthrodesis of hindfoot in posterior tibialis tendon dysfunction. Foot Ankle Int. 2013 Mar. 34(3):338-44. [Medline]. Lui TH. Arthroscopic Triple Arthrodesis in Management of Chronic Flatfoot Deformity. Arthrosc Tech. 2017 Jun. 6 (3):e871-e877. [Medline]. [Full Text]. Jagodzinski NA, Parsons AM, Parsons SW. Arthroscopic triple and modified double hindfoot arthrodesis. Foot Ankle Surg. 2015 Jun. 21 (2):97-102. [Medline]. Milshteyn MA, Dwyer M, Andrecovich C, Bir C, Needleman RL. Comparison of two fixation methods for arthrodesis of the calcaneocuboid joint: a biomechanical study. Foot Ankle Int. 2015 Jan. 36 (1):98-102. [Medline]. Coughlin MJ, Smith BW, Traughber P. The evaluation of the healing rate of subtalar arthrodeses, part 2: the effect of low-intensity ultrasound stimulation. Foot Ankle Int. 2008 Oct. 29(10):970-7. [Medline]. Seybold JD. Management of the Malunited Triple Arthrodesis. Foot Ankle Clin. 2017 Sep. 22 (3):625-636. [Medline]. Aarts CA, Heesterbeek PJ, Jaspers PE, Stegeman M, Louwerens JW. Does osteoarthritis of the ankle joint progress after triple arthrodesis? A midterm prospective outcome study. Foot Ankle Surg. 2016 Dec. 22 (4):265-269. [Medline]. Progression of talocalcaneal (subtalar) joint degenerative joint disease many years after calcaneal fracture with anatomic open reduction with internal fixatio. Osteophytes and degenerative joint disease easily seen at talonavicular, calcaneocuboid, and talocalcaneal (subtalar) joints. Anteroposterior view depicting talonavicular and calcaneocuboid joints. Articular surface on talar head rotated medially from concave articular surface of navicular. 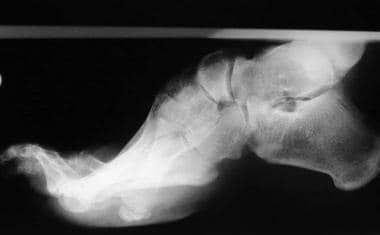 More than 7° of displacement is considered abnormal and is commonly found in valgus deformity with abduction of forefoot. Harris-Beath projection allowing visualization of posterior facet of talocalcaneal (subtalar) joint and varus/valgus rotation. Lateral view demonstrating talocalcaneal angle (yellow angle marker), talus first metatarsal angle (black angle marker), and calcaneal inclination angle (red angle marker). Anteroposterior view demonstrating talocalcaneal angle (black angle marker), talus first metatarsal angle (red angle marker), and degree of talar head rotation from navicular (yellow marker). Talocalcaneal (subtalar) joint injection via sinus tarsi. Lateral incision is made from just inferior to distal tip of lateral malleolus to base of fourth metatarsal. This allows exposure to talocalcaneal (subtalar) joint, calcaneocuboid joint, and lateral portion of talonavicular joint. Care is taken to avoid branches of sural and superficial peroneal nerves running just inferior and superior to incision. This approach follows plane between nerves, but small branches may enter area and should be avoided if possible. Anatomy of lateral incision: (A) lateral incision, (B) lateral malleolus, (C) base of fourth metatarsal, (D) base of fifth metatarsal, (E) peroneal tendons, (F) sural nerve, (G) intermediate dorsal cutaneous nerve. Deep structures encountered through lateral incision: (A) Hoke tonsil before removal, (B) L-incision along insertion of extensor digitorum brevis (EDB) and across calcaneocuboid joint, (C) deep fascia over EDB. (A) Extensor digitorum brevis elevated to expose (B) calcaneocuboid joint. (C) Hoke tonsil. Exposure of (A) calcaneocuboid joint, (B) talocalcaneal (subtalar) joint, and lateral side of (C) talonavicular joint. Medial incision is made beginning just anterior to distal tip of medial malleolus extending dorsomedially to naviculocuneiform joint. It lies between anterior and posterior tibial tendons. Saphenous vein and nerve are typically located slightly dorsal to incision and should be carefully retracted away during dissection. Anatomy of medial incision: (A) medial incision, (B) medial malleolus, (C) posterior tibial tendon, (D) tibialis anterior tendon, (E) saphenous vein. Dorsal exposure of talonavicular joint. (A) Talus. (B) Navicular. Lateral view showing talocalcaneal (subtalar) joint arthrodesis with 7.3 cannulated screw going from talus to calcaneus. 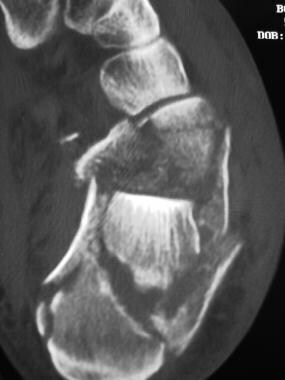 Lateral view showing talocalcaneal (subtalar) joint arthrodesis using a 7.0 cannulated screw from calcaneus into talus. Subchondral bone in joint with degenerative joint disease can be very sclerotic and hard. It may be wise to extend guide hole from near cortex in navicular all the way through talonavicular joint and into talus, even when using cannulated screws that are self-drilling and self-tapping. Corkscrew-appearing hardware represents threads from cannulated screw that delaminated off implant during attempt to cut through subchondral bone in talar head. Talocalcaneal (subtalar) joint arthrodesis using 2 screws for fixation. This technique has increased in popularity owing to its added strength and rotational stability. Headless screws offer potential for less irritation. Locking-compression plates have also gained in popularity, owing to their ease of placement, excellent strength, and impressive compressive force. Primary author has taken to using these almost exclusively for calcaneocuboid and talonavicular fixation and attributes them to early bone union and weightbearing. Double arthrodesis of talonavicular and talocalcaneal (subtalar) joints. This procedure can be done entirely through medial incision and should be considered in severe valgus deformity where lateral skin breakdown is concern.